Five Stars: this is a work that will grace my bibliophile shelves, for which I will likely read other books by the author, and for which I’ll read again, and will likely become part of my “comfort reads.” These are books that have wrecked, changed, inspired, or otherwise rewarded me doubly for spending time with them. Four Stars: means I’ll likely read it again, as well as recommend it to others. Three Stars: is a book I’d recommend people read. Two Stars: means that I found pleasure in reading it to the end, but I likely wouldn’t recommend it to someone else – and I likely list what that reason is. One Star: are typically books I can’t finish. But, they get one star because every reader is an individual. What I can’t finish, you may love. Also, the author put the story out there and that is brave and incredible and I give those props for that. Typically I will denote why I believe I can’t finish the story. My first read through this book took about 48 hours – the same amount of time before the narrator of the story finds she is nearly alone in Area X, a place that terrifies the world outside. For those of you who know me, getting a book read in that short amount of time is unheard of in my busy life. Regardless, I immediately began to read it again. In 20 days time, I had read it through a second time. Obviously, this factoid means you’ll likely find it a fast read, too. 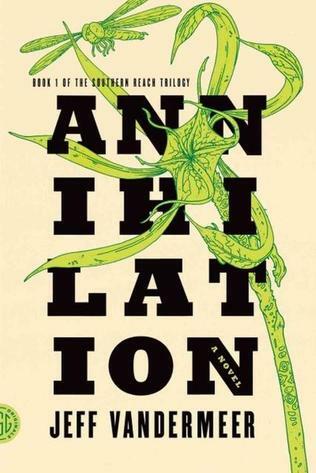 ANNIHILATION is the first book in the Southern Reach series, where the reader joins the 12th expedition into Area X, which has been cut off from the rest of the world for decades. Nature has reclaimed the area and multiple expeditions into the area have been met with mysterious tragedy. The 12th expedition is made up of four women: an anthropologist; a surveyor; a psychologist, the government-appointed leader; and the narrator, a biologist. Their mission is to map the terrain, record all observations of their surroundings and of one another, and above all, avoid being contaminated by Area X itself. VanderMeer’s reputation for writing the weird does an ouroboros on itself in ANNIHILATION. He circles the reader back and forth so that you can sense that nature is not only devouring humanity, but itself throughout the book, and doing so in an unknown, yet spooky way. In science fiction, the theme of man creating something unnatural is prevalent; VanderMeer turns that theme on its ear when it’s perhaps nature doing that to humanity. VanderMeer proves himself a writer’s writer in this latest work – dumping psychology, horror, science fiction, and mystery all into this first book. The language, descriptions, interiority of the narrator (the biologist) are all at once dominating, unsettling, and thrust the reader out of their comfort zone – much like Area X in the story. Underlying all the weird in the story is an undercurrent of a sad love story between the biologist and her husband, a member of the ill-fated 11th expedition, who did return, only to be taken from her. As noted above, this book pushes genre borders, for which I find as another positive for reading this book. Mish-mash genres and give me a little of all the things I adore. ANNIHILATION does that. So is it 4 stars or 5 stars? On your recommendation I put a couple of books on hold–I just picked up _The Book of Lost Places_ by Jeff VanderMeer and Under the Empyrean Sky (The Heartland Trilogy book 1) by Chuck Wendig. I don’t know when I will have time to finish these books, but when I do I will let you know :). Thanks for suggesting these authors! 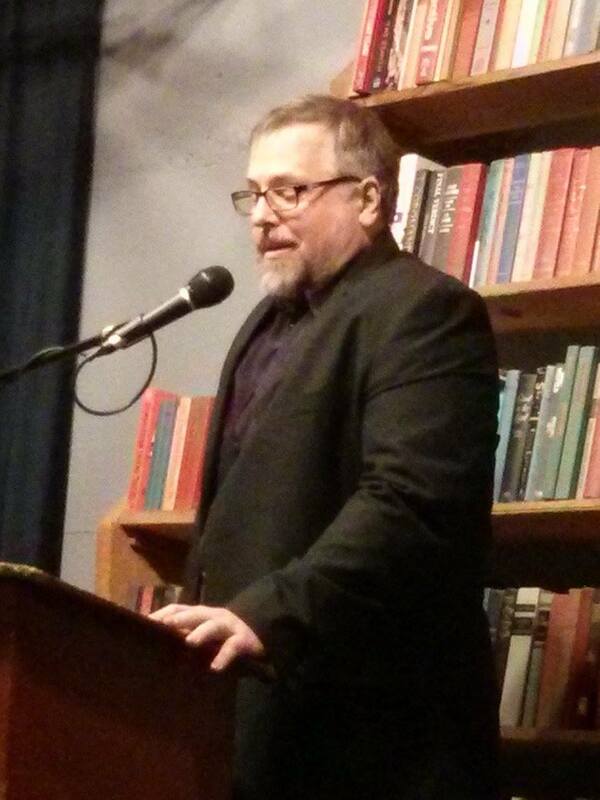 So happy to expose folks to other literature and art. This is why I do what I do. Thanks, D.C.! Oh, and this is 4 stars; however, if he keeps up like this — the entire series may be a five-star in my library. Can’t wait to read Authority.